New Weird Australia is concluding its mission after five years in operation, and will mark the moment with a three-volume set titled "Passages". Each volume is curated by one of New Weird Australia's three directors - Stuart Buchanan, Andrew Tuttle and Innez Tulloch - and features 51 tracks from the project archive, including music from Holy Balm, Guerre, Kučka, No Zu, Kirin J Callinan, Oscar Key Sung, Matthew Brown, Chrome Dome, Mere Women and many more, with design by New Weird Australia art director, Heath Killen. 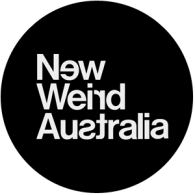 Since its inception in 2009, New Weird Australia has established a number of projects in support of Australian experimental music, clocking up over 400,000 downloads in five years, distributed through its own online channels and via its long-standing association with WFMU's Free Music Archive. New Weird Australia projects included its 23-volume compilation series, the acclaimed netlabel Wood & Wire, the "New Editions" series of individual artist releases, a long-running radio show on Sydney's FBi and a nationwide series of live shows. New Weird Australia founder Stuart Buchanan notes: "When we launched five years ago, Australian experimental music was often frustratingly hard to uncover. We saw an opportunity to connect audiences into work that was beyond the fringes, and offer artists opportunities to widen their community. Although that mission could well be endless, online networks now afford artists easier access to fans and supporters, in ways we could not have imagined five years ago. This therefore feels like a good moment to conclude, to reflect on the collective achievements of all the artists involved, and to showcase some of the work that has made the project so compelling." In addition to the 'Passages' compilation trilogy, New Weird Australia's netlabel, Wood & Wire, will release its final album featuring exclusive soundtracks recorded for FBi's "Ears Have Ears" experimental music program, with extended material from Fatti Frances, Rites Wild, Hollow Press and Cycle~ 440. Download from woodandwire.com.au. The full New Weird Australia project archive will remain online indefinitely, acting as a record of a unique and vibrant period in the outer limits of Australian music.